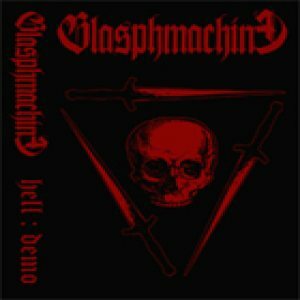 RANDOM: BLASPHMACHINE "hell : demo"
I think Kelantan has become the deathbed for some seriously fukked up and intense bestial black death exploits. Enter BLASPHMACHINE which, with their "hell : demo" provide the scene with probably one of the most unrelenting bestialised release so far. This, and the DARKREGIME demo, unleashed the fury of the Kelantanese scene, a pattern of which remains to be seen whether it will keep on the savagery or pointing towards another direction. This tape is so full of anger, there is nothing else to be felt upon listening. It's hate, hate, hate evaporating all over it. It's a single-minded aim for the kill. It is that singular and focused. Such is to the point that these 3 tracks seems like one sole opus divided into three parts, and with one single mission, which is to maim and crush. They're very similar and closely connected to each other. Whether this formula does it again for their longer playing release, we have to wait on that. It's a waste of time if you're looking for adventurous listening here ( I'd welcome a little, just very little, BLASPHMACHINE), this is geared to the final ratio of absurdity. I suggest you get the CDr version of it, my tape got chewed quite a bit by the player ("Sincere Musical Trading" cassette tape used, where the hell did they get this tape, which totally fails in quality, haha).